We feel a great joy to celebrate the Feast of the Epiphany with you, the Christians of Istanbul. 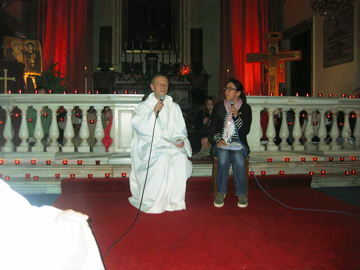 Since our arrival we have gone from one surprise to the next: everywhere, in different churches, we find a warm welcome. Is it not a sign that Christ unites us already, that we are in communion beyond different confessions and traditions? Indeed, through our baptism, we are all part of the Body of Christ. We have come from 25 different countries to join your churches, which themselves are also very international. And we praise God for having given us the opportunity to live a sign, humble though it is, of Christ’s manifestation among the peoples. We have come as pilgrims. For some of us this pilgrimage began in November in Kigali in Rwanda. Many young East Africans, and from further afield too, came to express their desire for peace and reconciliation in a country that has suffered so much. Then we were in Rome with Orthodox, Protestant and Catholic young people for the European Meeting. Pope Benedict welcomed us for a common prayer in St. Peter’s Square. It was a memorable experience, the square full of young people, each carrying a candle, the light of Christ. There too, it was like we were able to anticipate that Christian unity which we long for so much. We have come as pilgrims. Our whole life is a pilgrimage. We are en route to a more personal communion with God and to a deeper communion with each other. It is essential that each one of us lives these few days not just as an interesting visit, but as an inner pilgrimage, uncovering within ourselves the sources of trust in God. It is vital today to respond in a new way to the question: why believe in God? In a world where trust in God is less and less evident, a personal answer to this question can guide us in our lives. In the pilgrimage of our lives we need each other. No one can believe alone. This is true already at the personal level, in our families, our communities, our parishes. We need each other because each of us is, in one sense, poor. We need each other, too, between countries and even between continents. One of the causes of injustice and violence is ignorance of the other. We Christians, we can contribute greatly to world peace by building bridges through personal ties of friendship. And we need each other between different churches. It is only together that we can be the salt of the earth, otherwise the message of the Gospel risks losing its flavour. So the question arises: Do we Christians who come from elsewhere need you, the Christians of Istanbul? Without hesitation I say "yes". And I want to give two reasons why. During one of our discussions, a young woman from Kiev shared her feelings by saying, "In Kiev we have a St. Sophia’s Cathedral, built on the model of St. Sophia in Constantinople. For me to come here is to be welcomed by my Mother Church." This remark was moving, and I think in a sense it is true for all of us. Here, in this land, our faith was formulated in the Creed, the Christian faith was opened up to a culture that did not know the Bible. The Fathers of the Church deepened that faith. We all have roots here. In our time when, thanks to the modern forms of communication, we can more easily express a universal communion of Christians, it is also important to remember that communion in time that connects us to those who came before us. The second reason why we need you, the Christians of Istanbul, is that you give us a living example of how to live as a minority in a society where Christianity is marginal. We know how hard it is. And we are grateful for this sign of the Gospel. The light of the Epiphany which illuminates the world and the whole creation shines from the humble stable in Bethlehem and from Jesus’ baptism in the Jordan. Following Jesus, your light shines without you knowing how far it shines. So thank you for your faithfulness and perseverance. And we would encourage you to continue on the path of communion between different traditions and different churches. You pray together each year during the Week of Prayer for Christian Unity, and often at other times during the year. In that we are in communion with you. Our pilgrimage, I can already say this evening, broadens our understanding of this unique communion of the Body of Christ and it also expands our prayer for the Church. So we give thanks to God, the Father, the Son and the Holy Spirit.